Yessss! Saran Wrap nails! I freaking love this method - probably due to the fact that I cannot master water marbling to save my life - while this is no where near as rad looking as water marbling, I feel like it is marbly-effect-gone-grunge. Yup. 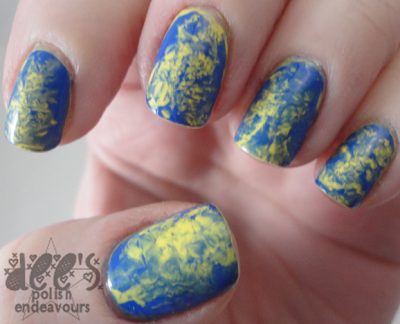 I really love blue and yellow combos.. so I decided to use Butter London Cheeky Chops & Nails Inc. Baker Street. Perfection. That is all for today! See you all again soooon! !